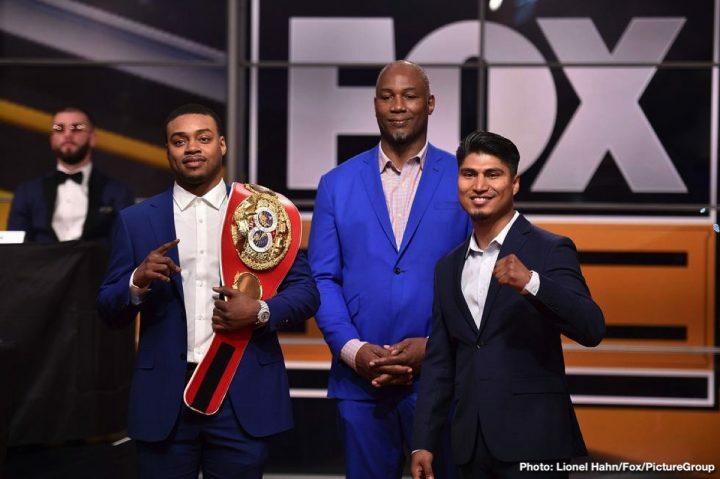 By Aragon Garcia: IBF welterweight champion Errol ‘The Truth’ Spence (24-0, 21 KOs) is considered by fans a big favorite to defeat challenger Mikey Garcia (39-0, 30 KOs) next month on March 16 on FOX PPV, but there could be an upset brewing on the night. Mikey says he’s already seen how the fight will play out in his mind, and he feels he’s absolutely going to win the match and have his hand raised at the end. Mikey will be fighting Spence on March 16 at AT&T Stadium in Arlington, Texas. Although Spence is from Texas, a sizable portion of the crowd on the night are expected to be fans of Mikey. Spence might even be treated as the visiting fighter by the boxing fans, if enough of Mikey’s fans show up to see it live. The crowd will play a big factor in this fight. The cheering will take these guys to another level as far as their performances. It’s going to be interesting. The boxing experts see the Spence vs. Mikey fight as a 50-50 affair. Like in his 39 previous fights in his career, Mikey has already picked how his bout with the bigger 5’9 1/2″ Spence is going to go, and thinks hes going to get the ‘W’ on the night. Boxing fans are assuming Spence wins just based on his bulk, being the bigger fighter of the two, and the more experienced guy in the 147 lb division. But there’s not much of a difference in weight from 140 lb division and the 147 lb weight class. Mikey showed last year that he could beat a world champion with zero problems with his wide points win over former IBF light welterweight champion Sergey Lipinets in March 2018. Mikey marched into San Antonio, Texas and beat Lipinets by a 12 round unanimous decision by the scores 116-111, 117-110 and 117-110. “I never discussed anything like that. I know my brother and dad will be looking out for me,” Mikey said to Ring Digital about the potential of trainer Robert Garcia or his dad throwing in the towel against Spence if he starts taking punishment. “I know they’re going to do the right thing. This is not in our mind. I never think about that. I’ve already won the fight many times in my head. I see myself winning this fight,” Mikey said. The reason why Mikey was asked about the Spence fight potentially being stopped by his trainer Robert Garcia is because he pulled him put of his bout with Orlando Salido in 2013 after he sustained a broken nose in the 8th round. Some boxing fans felt that the timing of Robert having the fight stopped was because Mikey was starting to take heavy shots from Salido, and he wasn’t controlling the fight like he’d been doing in the first six rounds. The fight went to the scorecards because of the nose injury, and Mikey won an 8th round technical decision. You can’t use that fight as an example of Mikey’s trainer Robert Garcia potentially throwing in the towel in his upcoming bout against the unbeaten Spence on March 16. Mikey had a bad injury to his nose that was impairing his ability to breath properly. With an injury like the one Mikey had, he couldn’t have been expected to stay in there and battle Salido for another four more rounds. Maybe if this fight was conducted in a past era like the 1950s, Mikey would have been left out there to fight with his injured nose against Salido, but not in this era. When fighters suffer bad injuries, such as the one Mikey had in the Salido fight, it’s the job of the trainer to alert the referee about the problem so that he can have the ringside doctor make a determination of whether the fight should be stopped or not. It was the ringside doctor that ultimately made the call to stop the fight. Robert didn’t throw in the towel. If he had done that, Mikey would have lost the fight. The only thing Robert did was tell the referee that Mikey had an injured nose from a clash of heads that occurred in the 8th, and the fight was stopped moments later after the ringside doctor made the decision. “I’m hoping after the fight my hand is raised,” Mikey said. “That’s all we think about. I don’t see myself losing at all. But I know if the moment comes, and there’s nothing else to do, then they’re going to do the best thing to protect me and take care of my health, if the referee is not the one to do it. The referee’s job is to do it, but if the referee isn’t there to help or if he doesn’t see what my brother sees or my dad, I know they’ll do that. If they see a fighter no longer has chance to win, then why keep them there to risk their health and sustain injuries? Stop the fight, that’s what a good trainer does,” Mikey said. Mikey has an excellent attitude about the fight. It doesn’t help him to think about him potentially getting hurt to the point where his trainer Robert or his father need to throw in the towel to protect him from being hurt by Spence. Mikey is thinking about how he’s going to out-box Spence, and keep him from landing his big power shots that he likes to land. Boxing is a sport won by intelligence. The fighters that used their mind like Muhammad Ali and Salvador Sanchez won in most cases, and the guys that survived on brute size alone, they were the ones that lost. Through the entire history of boxing, it’s been shown that the smarter fighters are able to overcome their bigger opponents. That’s the way the sport is. Spence’s size advantage is a little overrated. On fight night, Spence might have a 10 to 15 lb weight advantage over Mikey, but that’s it. In heavyweights, you’ve got guys outweighing WBC heavyweight champion Deontay Wilder by over 30 lbs, and they still lose. Spence’s weight advantage is overrated. The fight is going to be won the smarter fighter of the two. If that’s Spence, then he’ll receive the credit from the boxing public for beating a very good fighter in Mikey. Fans shouldn’t be surprised if it’s Mikey that winds up having his hand raised at the end of the fight. Spence needs to be very concerned about what he’s going to be dealing with in this fight, considering how motivated Mikey is right now. Mikey sees something in Spence’s game that makes him feel that he’s going to get the win at the end of the night. If Mikey didn’t believe that he could beat pence, then he probably would’t have taken the fight. Believe me; Mikey knows his limitations. He’s not calling out Saul Canelo Alvarez or Gennady Golovkin. Mikey knows that it wouldn’t be a winnable fight for him to mix it up with guys of that size and power level. Spence isn’t as big as Canelo and GGG, and he doesn’t possess their punching power either. Hence, Mikey is confident that he’s going to beat Errol on March 16 without too many problems.